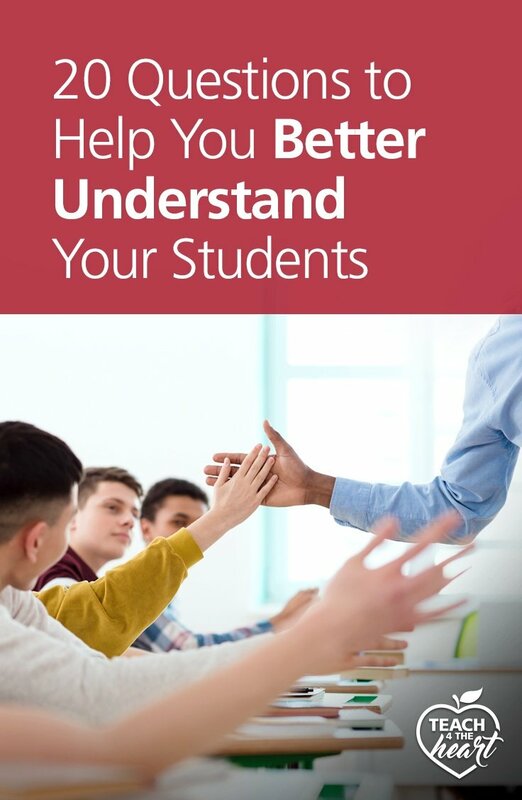 Wish you understood your students better? Here's twenty questions that will help you get to know them. We all know how important strong relationships are to successful teaching. But in order to build strong relationships, we need to understand how our students think and why they make the choices that they do. Often we think we know what student’s going on in our students’ heads, but we could be way off. And when we’re off, students can tell. They bemoan that we don’t get them (because, let’s be honest, we don’t! ), and any advice we give tends to fall flat. We get frustrated. Our students get frustrated. And it all becomes a big mess. So how do we remedy this? By actively seeking to understand our students. By getting to know not just their school persona but who they really are. This includes their background and home life, but possibly more importantly, their innermost thoughts and feelings that include their hopes, dreams, fears, and anxieties. Because when we start to understand what drives them, we begin to appreciate them as a unique individual, and our relationships blossom. And when challenges arise, we can talk about the real issues and address their true thoughts, motivations, and fears, rather than the ones we thought they had. So we’re back to the question of how. How do we get to know our students’ innermost thoughts and feelings? Things they might not even quite be able to put into words themselves. As we discuss in Beyond Classroom Management, the key is to be intentional. Look for opportunities to observe, notice, and ask good questions. And always be seeking to understand how your students think, what motivates them, what frustrates them, what they’re worried about, etc. But while observing and casual conversations are important, they’re also easy to forget about in the busyness of the day. That’s why a more intentional approach can be immensely helpful. And that intentional approach could be writing. `Now, no, I don’t care if you teach math. Student writing can enrich both your classroom and curriculum, no matter what you teach. I share some of my favorite ways to incorporate writing here, but one of the easiest forms is exit slips. Rather than wasting the last couple minutes of class, have your students answer a quick question and turn it in on their way out. These exit slips can often include academic questions like “tell me one thing you learned today” or “what’s one thing you’re still wondering about today’s topic?” But you can also intersperse questions that help you better understand how your students think. Questions like these…. 1. What’s one thing you wish you could change about this class? Why? 2. Describe one thing that makes you feel a sense of accomplishment. Explain why. 3. What was your first impression of this class? 4. What’s your least favorite part of school? Why? 5. Share a favorite memory you made with a family member. 6. What’s one thing you wish I knew about you? 7. What’s your biggest dream in life? 8. What’s one thing you wish you could change about our school? Why? 9. What’s one thing that you worry about? 10. What’s the best book you’ve ever read? Why did you like it? 11. What’s your family’s religious background? Does it match your personal beliefs? 12. If you could pick one person (dead or alive) to have lunch with, who would it be? Why? 13. Describe your relationship with your parents/guardians. 14. Describe a lesson you learned when you faced something difficult. 15. What’s one thing that makes you feel happy? 16. Describe something that annoys you. 17. Who is someone you consider a hero in your life? Why? 18. If you could live anywhere, where would you live? Why? 19. Who is someone you consider a friend? What do you like most about him/her? 20. Describe one of your favorite [insert holiday] traditions. And if you'd like to discover more strategies for how to connect with your students and build stronger relationships consider joining us in Beyond Classroom Management. 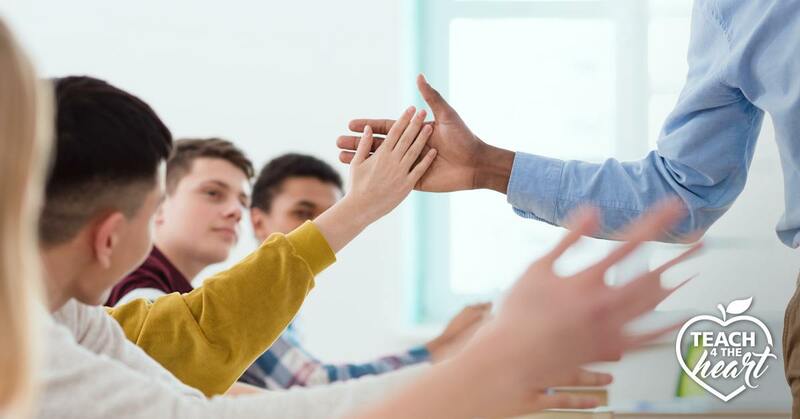 In this course, you'll learn strategies to help you create a classroom culture where, rather than constantly butting heads, you and your students actually work together to accomplish amazing things. Click here for more details about our Beyond Classroom Management course.